Regular readers and friends will know that I'm a sucker for a good bowl of noodles, and that Ramen reigns supreme as the noodle dish that is closest to my heart. First introduced to me years ago by my friend Dan Bankowski (better known as the hip-hop artist Coin Banks), the combination of deliciously umami broth, thin alkaline noodles with bite and toppings of pork, egg and/or chicken quickly stole pride of place from the Wanton Noodles of my childhood, and I've been obsessed ever since. The first meal Alissa and I ate during our honeymoon in Hong Kong was at Ichiran Ramen - a branch of a Hakata-style Tonkotsu specialist chain from Japan, and I've always made it a point to visit a different Ramen joint everytime I go to Sydney and Melbourne. Like the obsessed masses queuing up at Ichiran and other Ramen noodle shops throughout Hong Kong, the Cult of Ramen has certainly taken off in a big way in Melbourne and Sydney, with many centrally located shops throughout their respective CBDs and on major eat streets serving up excellent examples of all the major broth bases and regional style. While Perth's dining scene has come a long way in the last decade, we have far fewer Ramen shops in general, few that are centrally located and fewer still that I would considered to be truly great. There's arguably no Tonkotsu on the level of Gumshara Ramen in Sydney, or even Kokoro in Melbourne. Having spent a lot of time conducting Google searches for new or unexplored Ramen joints throughout Perth, I've found a great dearth of information for the Ramen obsessed beyond the usual CBD suspects of Nao, Dosukoi and Arigataya, and as such I've made it a mission to compile the most comprehensive guide to Ramen in the Perth metro area. Over a year of serious research and tastings has lead to the discovery that Perth has a surprising number of places serving Ramen - its just that many are located in South of the River suburbia. Below are mini reviews of all the bowls we've sampled in alphabetical order, with more to be added as we discover them. I'll be assuming some basic knowledge of Ramen broth bases and styles, however for the uninitiated Lucky Peach and Rameniac offer excellent guides to the Ramen Styles of Japan that should serve as a good primer. Since Tonkotsu broths are most prized for their lipsmacking heaviness (referred to as kotteri in Japan), I've decided to use the tare (the main flavouring component) as the main broth type where I felt it dominated the flavour. 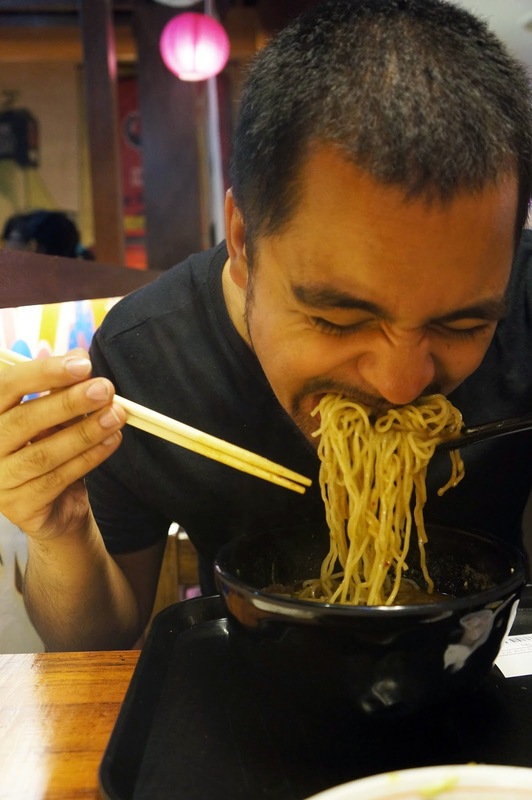 Hopefully this guide serves you well in your Ramen eating travels around Perth. Do you have a favourite not listed? Comment below and we'll add it to the guide as soon as we can. Arigataya was the first place I ever tried Ramen. For a long time their Miso Ramen was my favourite Ramen in Perth, however things went awry when it became the New Arigataya and many of the changes were not for the better. While less good than it was at its peak, the Miso Broth that was served with their Mega Ramen (pictured, since renamed Super Ramen) was still one of the best and most complex in town, even if Nao has overtaken it in my esteem. From a toppings perspective, there was also a lot to like; the Chashu slices were still some of the best in Perth and the Karaage were of a good standard, however the egg yolks were all set hard instead of custard-like. When visiting early last year, the biggest issue we encountered was the noodles - while Ramen noodles can come in a variety of styles, shapes and thicknesses in Japan, the previously excellent noodles used had been replaced with flat, Mi Poh-style noodles that had been cooked to an unacceptably soggy level that completely ruined the experience for me. Alissa and I didn't return to Arigataya for over a year as a result, and we were pleased to find that the noodles had greatly improved when we popped in for a recent impromptu visit. The new noodles used were tasty and cooked well, with very good bite. While the Miso Broth is still arguably Arigataya's best broth, they also offer Shio and Pork-based Shoyu broths. We haven't tried the Shio so cannot comment. The Pork-based Shoyu by itself is decent enough if a bit light, however Alissa and I recommend the Garlic Roast Pork Ramen - which is basically the Pork Shoyu broth topped with Mayu - Black Garlic Oil. The standard Pork Shoyu is a lot milder than the more collagen-thick Tonkotsu broths around town, and the addition of Mayu gifts the dish was an excellent depth of Garlic and Sesame flavour (without the off-putting flavour of raw sesame oil). It may not be my favourite anymore, but with the recent improvements Arigataya can once again be considered one of the better Ramen joints in Perth. Located in a fairly non-descript and run-down row of shops in St James is the oddly named Buen 151. Although the restaurant's signature dish is Chirashi and they seem to be more Soba-oriented when it comes to noodles, they do offer Ramen on their quite lengthy menu. Although made from a pork bones-based broth, their Ramen's broth is closer to Tokyo-style Shoyu. The broth is well balanced with saltiness, sweetness and umami in good measure, and the noodles were good if perhaps a little more well done than I prefer (but still within acceptable levels). Toppings were not overly generous but were all good, including a nice, slow cooked piece of pork shoulder alongside a slice of melt in your mouth Pork Belly, and a decent enough Semi (but admittedly closer to fully) Set Egg. This is not really Ramen I'd drive a long way for, but if I lived in the area I'd be more than happy to make this a regular ahead of others nearby like Sapporo, Kabuki and Izumi. Although I visited the restaurant fairly close to opening when trying the Ramen, the majority of tables were booked out by the time I left, so if dining during peak it might be an idea to book ahead. A longtime favourite of Ramen fanatics in the Port City, Dosukoi have a branch located in the Fremantle Markets as well as in the Perth CBD. The older Fremantle Markets stall is the one Alissa and I visit and in spite of a tiny market stall, they manage to move a lot of Ramen due to a very efficient and impressively managed ordering system, complete with an SMS service to let you know when a seat is ready. Dosukoi do Miso, Shio and Shoyu broths, however since Alissa and I always order the Miso broth, we can't comment on the quality of the other varieties. Their Miso broth is very good however, having the right distinctively sweet, salty and umami-rich flavour, and the noodles are cooked to the perfect level of bite. The only issue they can have from time to time is overdoing it on the salt front, however on a good day Dosukoi's Miso can come close to Nao's Miso broth in terms of quality. The toppings include a choice of Gyoza, Chashu and Karaage amongst others. The Prawn Gyoza are probably the least interesting of the three, however I definitely recommend the unctuous Chashu. Their Karaage has a crunchy coating surrounding succulent, well marinaded chicken and can be ordered as a side dish. Two people sharing a side of Karaage along with individual serves of Miso Ramen with Chashu would be my pick for the best way to dine here. Dosukoi in the CBD are only open for lunch on weekdays and the Fremantle stall is only open Friday-Sunday, however the Fremantle stall has the distinction of being the only Ramen shop where you can eat a bowl for breakfast! Subiaco's Station Street Markets are not long for the world, and its all the more a shame given that I only discovered Fat Fish Food so close to the end of the Market's run after seeing a photo of the stall's Miso Ramen online. The sight of the dark and largely opaque Miso Broth piqued my interest, and we were pleased to find a Miso Broth that was satisfyingly rich in flavour and very umami. Nao and Dosukoi's Miso Broths would still be superior, however Fat Fish Food were not far behind - all the more surprising given that these guys are relatively unknown by comparison. The Chicken Shoyu Ramen - accurately dubbed the Fat Ramen - was even better, with what is the most impressively rich Shoyu Broth we've had in Perth. The broth tasted like it was made with copious amounts of roasted chicken bones for an intensely umami flavour, while chicken fat seemed to have been emulsified back into the broth to give it an unctuousness more similar to Tonkotsu than any of Perth's other examples of Shoyu Broths. This is really good stuff. The curly noodles were cooked perfectly for the right level of bite, and were very similar to what we've been served at Kai and Dosukoi. Toppings options included Pork and Chicken. The Pork was flavoursome and decent enough, however I would suggest their Chicken to be the superior choice. Succulent pieces of perfectly cooked Chicken were served in a generous portion with the Fat Ramen, making a strong case for the excellence of Chicken-oriented Ramen. Here's hoping that Fat Fish Food find a new home after the Market's close as it will really be Perth's loss. After spying Ramen on the menu of Hikaru's Brookfield Place branch, the opening of a Ramen-oriented restaurant as their third CBD branch was exciting news. When they first opened, the restaurant offered all 4 major styles, although Shio has since been discontinued. Their Tonkotsu Ramen is similar in style to Tatami in Bateman, except with greater intensity of porky flavour. Although I prefer the seasoning of the Tonkotsu at Lucky Chan's, the lip-smacking collogen richness here is probably the most legit in town. The noodles were good too, and had the prerequisite bite you'd expect from Ramen. The Chashu was not very impressive, being tougher than the best places in town, however the well marinaded and crispy fried pieces of Karaage served here are very impressive - a must order topping. The Miso broth is also fairly decent, however Alissa and I agreed that the Tonkotsu is the superior choice. Compared to the gold standard Miso Broth at Nao, Hikaru's broth needed a bit more garlic and salt, with Alissa saying that the Tonkotsu simply had 'more balls to it'. Regardless of which broth you go with, one of the best things about Hikaru is that they offer free Kae-Dama - the tradition of providing an extra serve of noodles for those who request it! Situated in the heart of Albany Hwy's Victoria Park dining precinct, Izumi's Ramen was a bit of a disappointment given its central location. The broth tasted like it was based on chicken, pork and dashi with a Shio-based tare. There was quite a strong Sesame Oil flavour that seemed a bit over the top, and while decidedly umami it felt like the broth's monosodium glutamate content was artificially bolstered by its much maligned white powdered form. The noodles were overdone, as were the fully set Eggs. Conversely the Karaage tasted very good flavourwise, but was underdone; they were simply not crispy enough and tasted like the oil used was not as hot as it needed to be. This was a just passable Ramen that I would find hard to recommend - and overpriced considering. Located just a short walk down the road from Izumi, Kabuki's Tori Miso Ramen may be in a different style to Izumi's, however it is similarly disappointing. While fairly umami, the Miso Broth was thin and uninteresting and featured a similarly over the top Sesame Oil flavour that was off-putting, and actually made me feel a little sick afterwards. The noodles were not entirely appealing in texture or flavour, making this even less likeable than Izumi's. The bowl's only strong point would be the generous slices of crispy Tori (Chicken) which were some of the best pieces of non-Karaaage chicken I've had as a Ramen topping. Alissa ordered Teriyaki Salmon and I was filled with food envy as that dish was well executed, suggesting that Kabuki are good at other things but Ramen is just not their strong suit. The excellent chicken and the broth being slightly tastier than the Shio we had at Lucky Chan's Night Noodle Market Pop-Up is all that prevents Kabuki from being at the bottom of the Perth rankings. Not recommended. Located in Bull Creek just 5 minutes from our home, Alissa and I are well any truly regulars of this unassuming suburban gem. Kai serve three different styles of Ramen - Shoyu, Miso and Tonkotsu. While the Miso and the Shoyu are pretty good, its their Tonkotsu that is the main attraction here. The Tonkotsu looks to be made in the Nagahama style (from what I know if it), and although not as lipsmackingly collogen rich as the closely related Hakata style of Hikaru or Lucky Chan's, there is still a great depth of porky umami flavour to the broth with a welcome garlic and sesame-forward flavour profile. Having dined here repeatedly over the last 3 years, the noodles are always consistently cooked well - and they even package the noodles separately for takeway orders to ensure it doesn't get soggy. The toppings are good, with the egg always semi-set as its meant to be. The one time I ordered the Chashu, I found it a little on the dry side, however their Karaage is excellent and can be swapped in for no extra cost. And at $9.80, Kai's Ramen is supremely good value for one of the best bowls in Perth. Note however that this tiny, no reservations restaurant is extremely popular and wait times can be considerable during peaks. Its best to come down early to avoid disappointment. Kanta has long been a favourite of foodies in the know, and are particularly renowned for such signature and relatively uncommon dishes as Scallop Wrapped in Salmon, Beef Tongue and Kamo (Duck) Steak. Although more focused on Udon, their Shoyu Ramen is noteworthy. Unsurprisingly for Udon specialists, the broth has a purity to its more akin to Udon and Soba broths - indeed, this seems to be 'Chuka Soba' in the Takayama style of Ramen. Lighter than the chicken and/or pork-based Shoyu broths of Tokyo Ramen, the Dashi and Soy-based backbone of Kanta's broth is given surprising complexity due to a pleasing garlic and onion/leek flavour, and is well balanced even though it looks like a very simple bowl of watered down soy sauce. As far as lighter styles go, this is probably our favourite in Perth. Noodles were also well cooked, though perhaps a smidge beyond the absolute right level. The toppings were less interesting, with the Teriyaki Chicken a bit waterlogged and a Semi-Set Egg costing extra. With some good entrees, the toppings issue is less of a problem. Given the amount of other amazing things on Kanta's menu, this a restaurant worth driving for. Bookings are definitely advised. The Ramen noodle bar with the most high profile opening I can recall, Lucky Chan's do all four major Ramen broth categories, and Alissa and I have tried both their Tonkotsu and Spicy Miso broths at the restaurant. For our tastes, the Tonkotsu is the better of the two. Compared to Hikaru, the broth is not quite as lip-smackingly collagen rich, however the overall flavour of the broth is the most similar to Hakata-style broths I've had overseas and over east, and had a good porky flavour. The house made noodles used are thinner that others in Perth and is in the straighter style more commonly associated with Hakata. When we visited the restaurant, the noodles were either a bit under for the less than steaming temperature of the broth, or were at the perfect level if the broth had been steaming hot as it is supposed to be, as this allows noodles to continue to cook at the table. Either way (hotter broth or longer cook for the noodles), this is something I feel that they will get better at as time goes on. My biggest issue with Lucky Chan's was the toppings, as while the Chashu was impressively melt in your mouth soft, it left me wanting more - especially when the optional Sous-vide Egg or extra Chashu would have cost extra. At $17.90 without any extras, it is already the most expensive standard size bowl of Ramen on the list; with the Egg for an extra $3 its close to double the cost of a bowl at Tonkotsu at Kai or Hikaru! Danny Ramen - the chef's choice dish - is basically a Sapporo Spicy Miso Ramen with Butter, Sweet Corn and Minced Pork. The broth had a good depth of umami flavour, with the butter providing a lot of richness. It may not have been on the same level as Nao, Dosukoi or even Arigataya, but it was certainly a step up from the Sapporo Ramen at Sapporo in Carlisle. Noodles were the same as the Tonkotsu (acceptable level of doneness but a little underdone or the broth not hot enough), and while the Minced Pork was tasty, Alissa wished she had the choice of Chashu, Karaage or even their Ramen Fried Chicken instead. Still, there was a lot to like here and at $15.90, the Danny Ramen is closer to a sensible price for a bowl of Ramen. Ahead of their official opening, Lucky Chan's operated a Pop-Up stall as part of Eat Drink Perth's Night Noodle Markets serving Shio Ramen. This would take the prize for the worst Ramen I've ever eaten. The fact that Shio is generally one of the lighter broth styles does not mean is has to be any less complex, and yet this broth tasted like little more than Chicken Stock and Salt. If there was Dashi in there, it was either in far too small a quantity or too weak an intensity when compared to what was needed to boost the umami. Worse still were the noodles which were soggy and overcooked, and the dry, tasteless pieces of Chicken Breast that served as a topping. The dish's only saving grace was the Half-Cooked Egg, which with its perfectly soft set yolk was one of the best I've had since Ichiran in Hong Kong. While I have not tried the Shio in store - and I'm sure its better in a controlled kitchen environment - this bowl was enough to scare me away from ordering the Shio. If you tried this during the Noodle Markets please don't judge Ramen by this bowl - it can only get better from here (and indeed, Lucky Chan's other bowls are better than this!). Nao is arguably the most famous and well regarded of Perth's Ramen Noodle Shops. And with good reason - Nao's is the best Miso Ramen in town and is, on balance, the best overall bowl. The house made noodles display an excellent, springy and toothsome bite and are available in regular as well as spinach and chilli flavoured variations. While the the Chashu is good but not mindblowing and I prefer Karaage to the Teriyaki Chicken served, Nao offer a lot of welcome customisation options at a reasonable price such as extra garlic or a butter and corn combo to make it Sapporo-style. Best of all, the broth is truly excellent, being umami-rich and flavoursome enough to stand up favourably against the intensity of rich Tonkotsu broths. For Ramen beginners, Nao's Miso Ramen remains the best place to start your addiction. Nao also offer Tsukemen (dipping noodles), however I personally think the more traditional Ramen style is superior here. Nao rely on the broth to warm through their Chashu and Teriyaki, and with lukewarm noodles the broth goes cold pretty quickly after a few dips. Additionally, a greater intensity of broth is needed to really coat the noodles, yet from what I can tell the Tsukemen's Miso Broth is identical to that used for the regular bowls. Go for this only if you're really fussy about how well done your noodles are and don't mind a rapidly cooling broth. As a noted David Chang fan boy, it was no surprise to discover Clint Nolan's Pleased to Meet You served Roast Pork Ramen (his Fremantle outpost Who's Your Mumma has long served 'Dr. Chang's Pork Buns'). The noodles were toothsome with the prerequisite bite, the slice of Chashu melt in your mouth soft, and the sous-vide egg was cooked perfectly, however the broth was a bit of a let down. The broth tasted pork-based, however it was ultimately overly salty and had something of a tomato flavour that I found off-putting. When there are such incredible and superior dishes as Duck Tacos and Beef Tongue Ruben on the Pleased To Meet You menu, it is probably best to give this Ramen a miss - especially at $17 a bowl. Located just across the road from Carlisle Train Station and run by a sweet old Japanese lady who speaks very little English, Sapporo unsurprisingly make a Sapporo Ramen - a style distinguished by it use of butter and corn. Although advertised as a pork-based broth, what was served to me seemed to be more of a Miso and Dashi broth, with a particularly dominant Katsuobushi flavour (in a good way). The old lady had tried to say something was different from advertised, and I assume this is what she meant. With butter added, the broth had a decent umami flavour and unctuousness, although it was perhaps a bit heavy-handed in terms of saltiness and fell short of both Nao and Lucky Chan's Miso broths. Noodles were cooked well, maybe ever so slightly more well done than my perfect level but still within the acceptable range of doneness. Toppings of corn and butter were nice additions, and the well marinaded Teriyaki Chicken was very good, although the egg yolk was firmly set. Sapporo are a decent enough choice if you're living in the Carlisle area (and their Udon and Tempura are pretty good), however its not really a great Ramen I would drive long distances for. Also, stay well clear of the Takoyaki Balls - what we were served was soggy and seemingly microwaved! Located in the Car Yards and Asian Food district on Hulme Court, Sundays Everyday are more well known for their outrageously large bowls of Karaage Chicken, but for those wanting something less heavy they also offer Ramen as a special addition to their menu. The Miso and Dashi based broth is light but flavoursome, with a nice undercurrent of white pepper to give it a bit of character. The seaweedy flavour is accentuated by the kombu served as a topping, while the slice of Chashu was flavoursome if ever so slightly on the dry side. The noodles were good if not particularly noteworthy, and was on the softer end of the acceptable range for Ramen. A decent if very basic bowl, the asking price of $9.70 is reasonably cheap, however it does not compare to the value of the similarly priced Kai. Ironically, Sundays Everyday is open everyday except for Sunday. Go figure. Perth's masters of budget Japanese do their own simple take on Tokyo Ramen, and its probably the cheapest bowl in town. If they don't quite reach the heady heights of Perth's best, the noodles are still at least cooked to a level that still displays the prerequisite springiness. Being in a Tokyo style, this is a Shoyu broth with a strong Chicken-based backbone. Its flavour is decidely sweeter and less complex than most Miso and Tonkotsu broths but still tasty, and recalls for me the Asian-style Chicken Macaroni Soup I ate in my youth. Finally, the no-frills toppings include Taka's good but not particularly noteworthy Teriyaki Chicken, and a plain boiled egg with a fully set yolk. Good for emergencies and the budget conscious, but not by any means an essential bowl. Another budget bowl at a mere $7.20, TanPoPo's Ramen defines the term 'no frills' with only a choice of Chicken or Beef and some Spring Onions serving as a topping. While hardly the most exciting bowl in town I have to give TanPoPo credit for getting the fundamentals right, with a light but flavoursome Dashi and Miso broth that is very similar in style to Sundays Everyday accompanied by better than expected noodles. Along with a small by well cooked serve of Chicken, this was a surprisingly enjoyable if very basic bowl. Pro tip - order a side of Octopus Karaage (not pictured) to go with the Ramen. At $4.50 per serve, its a bargain and the crunchy, salty goodness makes for a nice menu hacked toppings upgrade. At $11.7, that's a very cheap deal. Located a few minutes down the road from Kai, Tatami have the misfortune of being the lesser overall performer. Tatami offer Tonkotsu and Spicy Miso broths. The Tonkotsu broth is similar in style to Hikaru's, however is considerably weaker; while somewhat porky, its not as flavoursome or as rich as a good Tonkotsu should be. With Tonkotsu's pride of place in the heart of many a Ramen fan, this is a real shame as their Spicy Miso broth is considerably better, and has a pleasingly rich flavour. Its not quite as good as Dosukoi or Nao, but is superior to Kai's take on a Miso broth. The Ramen noodles themselves are cooked well with good bite, although a bit generic compared to somewhere like Nao. Tatami also offer fairly good toppings of fall apart Pork Belly with the Tonkotsu, and Karaage. I've had better version of both these toppings elsewhere, however their Half Cooked Eggs are probably some of the most impressive in town, as they tend to be fairly consistent when it comes to getting the yolk set to a nice, custard-like consistency. Along with Tatami, Zensaki unfortunately have one of the weakest Tonkotsu broths in town - I think the guys at The Pavarotti said it best when they referred to it as 'toilet-kotsu', and I concur with their view that the broth was extremely bland - strange when the restaurant claims to boil their broth for 24 hours. I have not tried their Miso, Shoyu or Shio broths, so it might well be the case that they are specialists in another style and I just picked their least impressive broth. Everything else in their Ultimate Ramen bowl was considerably better; the noodles were decent and the Chashu slices were amongst the best in Perth with a lovely melt in your mouth quality. The egg yolk was nice and half set and the Karaage was tasty and remained crispy in spite of being in a broth. While I would stay far away from their Tonkotsu broth, I feel that if their toppings are any indication they, like Tatami, might well have another broth worth trying. Definitely something that requires a bit of further investigation. Thank you! I agree, that Nao and Dosukoi are worthy of being right near the top of the list for some of the best bowls in Perth. I feel like I need to print this out and go on a ramen-hunting outing! I'm always impressed by your posts, and the amount of thought you put into each of them! I simply love your reviews. Really helpful. Thank you so much. Should do a dry style noodle review next? Hey man, good to hear from you! I've got a Vietnamese guide coming up next, but not for a few months still. Dry noodle would also be a good idea! You are most welcome! This post will continue to be updated as more places pop up!